I chuckled when I saw this. 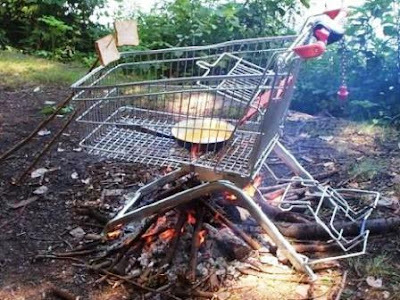 It’s a shopping cart turned into grilling stove. The above even shows the cart in action with wood fueling the cooking of a soup dish. A couple of sliced bread skewered on a tree branch leans on the cart, waiting to be toasted. Alright, I must admit it is no-cost indeed (legal?)! But I don’t think I’d like to cook in that thing. The walls of the cart just get in the way when cooking, grilling and moving pots.. It’ll be like tending to a baby in a crib rather than cooking! Your lower back may not thank you after each cooking session. It takes up way too much space and you’d have to pile up wood fuel that high just to reach your pot (mini-bonfire?). I suppose it will be more inconvenient in the long run compared to the grill grate I proposed. The bars in the ref grill grate are thicker, sturdier and spaced just right. But that cart idea was clever though! Thanx for that tidbit of info Greg. And thanx for dropping by!